In crime fiction, particularly at the lighter, cosier end of the genre spectrum one of the issues that authors have to deal with is what I’ll call the Cabot Cove Effect. That being that in reality small towns and communities simply do not experience the number and variety of murders worthy of dramatic re-telling that even one book, let alone a series of them, demands. So there has to be something else about the books that makes it possible for readers to suspend disbelief. In my experience a lot of authors completely fail to achieve this which is the main reason I follow so few lighter series (many are started, few are finished). Having now published the second of what I hope will become a longer series of books set in the fictional Victorian town of Rusty Bore, population 147, Sue Williams could give lessons on how to get it right. 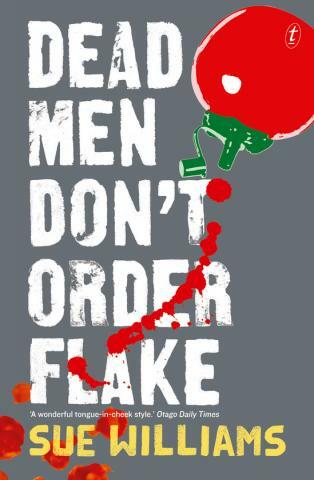 DEAD MEN DON’T ORDER FLAKE follows on from MURDER WITH THE LOT but you don’t have to have read the first book in order to enjoy this one. That fact is worth stating explicitly as it’s often difficult to dive into a series at anything other than the beginning so I am impressed when a book stands on its own merits. Furthermore, you could easily go back and read the first book after this one which is even less common. Full marks. The next element Williams gets right is the tone of the story. It can’t be too serious (because of the aforementioned Cabot Cove Effect) but it can’t be so silly or gimmick-laden that it induces eye rolling in the average reader. Aside from the fact that there’s a higher than credible murder count for a small town, everything else about the story has a ring of truth so it is easy to ignore that one issue and go for the ride. The dead man of this book’s title is Leo Stone, an old flame of series heroine Cass Tuplin. Everyone in town thought Leo was dead. So dead they even held a remembrance ceremony and gave him a headstone. But he’s turned up now very much alive and with gun and/or diamond smuggling skills to his name. Or so the rumour mill goes. Meanwhile Cass is asked by the father of a local reporter to investigate her death. Police – in the form of Cass’ oldest son Dean – say Natalie Kellett was speeding and crashed her car at a notorious black spot. But her father is convinced this isn’t true. Could she have been working on a story important enough to have gotten her killed? Finding out proves to be very entertaining with lots of humour offsetting the dramatic moments. The characters here are the sorts of people you work with or are related to or are neighbours with. OK maybe you don’t know anyone who owns multiple ferrets and don’t have a potential in-law who makes you buy g-string underwear while it’s on sale but I bet most of the characters display traits you are familiar with. The result is that it’s almost like being told a story about people you know. Sometimes they are annoying – I find Cass a mite too wrapped up in her adult children’s lives for example – but that’s what makes them realistic. And collectively Williams has created a group of people who are interesting and fun. Based on the number of unfinished ones littering my ‘books to donate’ pile I suspect it sounds a lot easier than it actually is to wrte this kind of book well. Sue Williams has the balance of humour and drama just about perfect and without going over the top on ‘ocker traits’ provides an authentic Australian sensibility for this story. With a dash of nefarious local politics, a mysterious romantic element and terrific minor characters spanning twenty-somethings to the elderly there is something – or someone – for every reader. 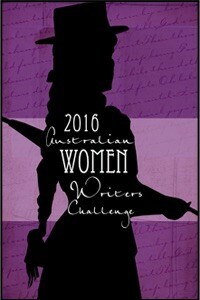 This is the 13th book I’ve read and reviewed for the fifth Australian Women Writers Challenge. 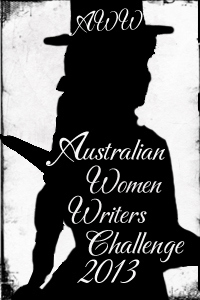 For more information about the challenge check out my challenge progress, sign up yourself or browse the Challenge’s database of reviews. Rusty Bore. There’s also Vern’s General Store. But it’s true the town’s not exactly overflowing with residents, and a stranger in Cass’s shop is quite an event. Especially one like Clarence: suspicious, bleeding, looking for a burger with the lot and somewhere quiet to stay. Cass knows just the place. Then she finds out more about Clarence and wants him out of town, but it turns out that’s not as easy as it sounds. And then she finds the body. Vern’s general store and my place constitute the CBD of Rusty Bore, along with a row of three galvanised-steel silos. It’s a town endowed with a royal flush of used-to-haves since the school, the pub and even the op shop closed down. Sue Williams’ writing displays a quirky sardonic tone that she manages to sustain throughout the novel. It shows in the town names – Rusty Bore, Hustle, and Muddy Soak – and in the characters who populate her novel, particularly in her central character Cass Tuplin. Leading Senior Constable Dean Tuplin is the sole policeman of Hustle and he is convinced that his mother is on the verge of dementia. She has a history of reporting deaths, well she’s raised a false alarm once before, and so when she reports a body that then disappears he is not particularly surprised. He blames his brother Brad who lives with his mother for not keeping her under better control. After that Dean doesn’t take anything that Cass says seriously, even when her car is stolen, and her takeaway fish and chippery is burnt down. But something very serious is happening in the background and Cass can see that no-one is going to help her get to the bottom of it. 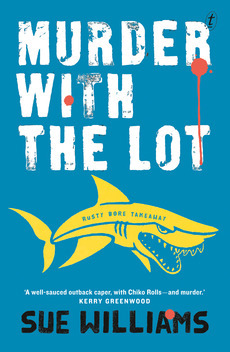 MURDER WITH THE LOT is a farcical romp around the edges of living in Australia’s Mallee country, with a murder or two thrown in, and a hefty dose of corruption among those who should know better. In style the book reminds me of Lisa Lutz and Kathy Lette, so if they are on the list of authors you like you might like to give this Aussie author a try. In the fictional town of Rusty Bore, Victoria, (population 147) Cass Tuplin runs one of two remaining retail outlets, namely the fish and chip shop. When a dodgy looking young man comes looking for a place to stay, where he can write his book, Cass somewhat reluctantly hands over the keys to her friend Ernie’s shack (Ernie having been placed in a nursing home just recently). But, based on a mixture of her own wild imaginings and the town rumour mill, Cass soon has second thoughts about having possibly let the shack to the wrong sort of person. But before she can evict the new tenant she discovers the body of a woman which goes missing before her policeman son has a chance to see it. With her nearest and dearest thinking she’s losing her marbles and Cass being the ultimate in interfering busy bodies mayhem quickly ensues. With tongue firmly planted in-cheek Sue Williams has delivered a very Australian novel with loads of chuckles amidst the aforementioned mayhem. Although Cass’ home town and its nearest neighbours are fictional they’re recognisable as not too far from the truth, even to someone who only visits such places occasionally (though all my childhood summer holidays were spent in a town with eery similarities). Cass’ first-person narration with its spot-on observations about the area and its locals and some first-rate dialogue provide an authentically Australian sensibility and are the highlight of the book. Cass is very funny at times. She is also very annoying at times. Alongside the nicely dry humour and gung-ho attitude she is over-involved in the lives of her two adult sons to a point that would have had me contemplating murder if she were my mother.but I know this doesn’t make her unrealistic. It did make my teeth grate on occasion though which is probably a reflection of my own fierce independence and an entirely different kind of relationship with my own mother. That aspect of her personality aside I did like Cass with her laconic, self deprecating voice and the ensemble cast of characters who surround her are, collectively, a treat (with my personal favourite being her youngest son’s on/off girlfriend Miranda who has a penchant for ferrets and blunt relationship advice). MURDER WITH THE LOT is the kind of light, fun crime fiction that we don’t seem to produce a lot of in Australia and it’s a fine example of the sub-genre. Of course it veers into far-fetched territory a time or three but that’s part of the fun with this kind of book, and there are some nicely poignant moments which ground the book a little and provide a nice contrast. It’s a nicely paced, gently humoured romp of a tale. Most enjoyable. Sue Williams is a science and travel writer and a chartered accountant who also holds a PhD in marine biology. She has had many articles published but MURDER WITH THE LOT his her first novel.